When I tuned into NY1 for the 9/11 ceremonies to hear the reading of the names they’d only made it to F; when I went back later they’d reached the R’s. I’d missed hearing the name of the only person I knew who perished that day. 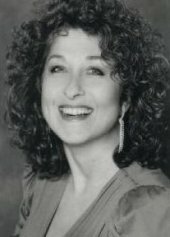 Rebecca Kaborie was a college classmate from Ohio, a fellow theater major who’d moved here in the early 80s to take her stab at the bright lights like the rest of us. She was a saloon singer in her bones, but she was also a crackerjack comedian with large, pleading eyes, a mop of short curly hair and a mezzo belt, one of those inimitable vocal instruments built for torch songs or those usually handled by the soubrette in musical comedies. That’s how I got to know her intimately—we were principle players at the local summer stock theater in Cincinnati, a place called the Showboat Majestic where I spent some of the happiest days and nights of my young adulthood. Once we moved to New York she and I lost track. Occasionally I’d run into her at a party thrown by mutual friends—the Cincinnati theater mafia was as strong then as it is now, judging from all the Broadway thesps who credit the University of Cincinnati’s College Conservatory of Music as their alma mater—or in midtown, in passing. We’d be running errands, or on our way to temp assignments or auditions. It was always a pleasure, a reminder of a happy past and good times before the realities of life and career took over and shook us awake. The last time I saw her was like any other, except that she’d let her hair grow out. We were both in our 40s by then; she was a hair older, and I remember thinking how she still had that spark, and what beautiful hair—a pity she’d deprived us of it in her youth. I can’t describe the heartbreak when I opened the Times to see her photo, the short essay describing her love of music, and the realization that no one would hear that voice again. Ultimately it didn’t matter that I failed to hear her name read this morning. In my mind I’ve heard it all day, and I’m grateful. Its sound is a needed corrective to the relentless dickering about who owns 9/11: the other families of the deceased who’ve perhaps had too much of a say over what happens on that hallowed ground where so many perished; the zealots who, in the name of patriotism, have conveniently lost sight of what that event truly represents, to the extent that it’s difficult to tell the difference between them and the terrorists; the real estate magnates who’ve dragged their cans, making it all but impossible for people to move on. Hearing the names should give us all perspective, or at least wake us up to what exactly was being attacked on that bright September morn. Please stop talking, everybody—listen. I can’t think of a better honorific for Rebecca Kaborie and all those other innocents who didn’t see it coming.